Americans are becoming fatter and fatter, Obesity has become an epidemic and it is the direct cause of many health issues and disease. In general people are becoming lazy and fat. More and more of society are consuming overly processed nutrient lacking calorie dense fast foods than ever before. These foods are filled with harmful antibiotics, pesticides, dyes, trans fats and hormones. Loosing weight is simple math, you must burn more calories than u bring in. 3500 calories is equivalent to one pound. It is pretty straight forward , for every 3500 calories u burn you will loose one pound. If you consume less calories and burn more calories by exercising you loose weigh rapidly. I have developed a system that is simple and works quite well. This system uses the highest quality nutrients available when combined with a little exercise and sunshine enables most to loose weight rapidly and safely. The largest most calorie dense meal in most American households has traditionally been supper. A typical supper may consist or spaghetti / meat balls, 2 slices of French bread and butter, salad with oil & vinegar, glass of sweet tea and a red wine or cold beer followed by desert. This meal will have between 2500-2700 calories depending on how much u eat. Many will go back for seconds and have a much higher calorie load for this one meal than 2700 calories. 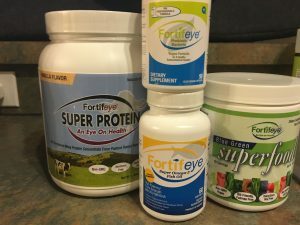 My simple system consists of taking one scoop of Fortifeye Super Protein combined with one scoop of Fortifeye Blue Green Super food with two cups of spring water and gently blend or shake. Drink this and take one Fortifeye Super Omega with the shake and one at bedtime . New science indicates 1.5mg- 2mg of omega 3 fish oil enhances weigh loss by increasing fat metabolism. This combination will give you 20 grams of the highest bio-available non denatured whey protein concentrate from grass-fed New Zealand A2 cows with only 120 calories. The Blue Green Superfood is a combination of 12 FODMAP free fruits and vegetables with only 25 calories and the omega 3 fatty acids will have 12 calories. This is a complete meal replacement that has only 157 calories , 3 carbohydrates, 1 gram of sugar and 3.9 grams of fat. You are getting everything you need for a complete nutrient packed meal in one drink. The Blue green superfood was made with fruits and vegetables that do not aggravate Irritable Bowel Syndrome. If you drink this every day as a meal replacement for your supper and you were eating the typical American supper you will loose between 4 and 5 pounds per week . Once you start the program you will see it is easy to follow. New studies indicate a good whey protein will actually decrease hunger urges and curb your appetite making it easier to follow the plan. 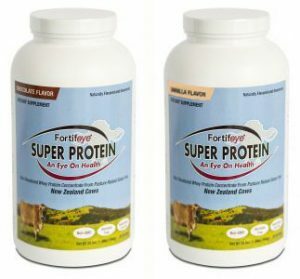 This whey protein concentrate will also enhance the production of your “master antioxidant” called Glutathione. I recommend adding a little cardiovascular exercise 30-40 minutes a day and you can burn and additional 200-400 calories daily. This could equal another 1/2 to 1 pound of weight loss per week. I also recommend a half hour of sun a day between noon and 2 pm without sun screen to get adequate Vitamin D. Several studies have confirmed a link between vitamin D deficiency and belly fat. So by getting a little bit of a sun tan it may actually help with the weight loss and make you look healthier at the same time. It is a good idea to wear a hat and good pair of sunglasses while out in the sun. Fair complexion people may want to only stay out in the sun for 20 minutes and darker complexion may be able to stay out for 45 minutes. I recommend half of the time on front and half on the back. If you are taking any medication that may make u sensitive to the sun or have a medical condition that may also make us sensitive to the sun then u will need to consult with your physician first. I have 100s of patients that have followed this regiment and have lost significant amounts of weight safely , improving their over-all health and ocular health as a result. This was developed to work well with diabetics, celiac, IBS and people following the paleo or low carb diet. The addition of a good Probiotic 3 times a day on an empty stomach can enhance the weight loss. I recommend probiotics to everyone over 40 especially if they have any digestive issues , extra belly fat or bloating. 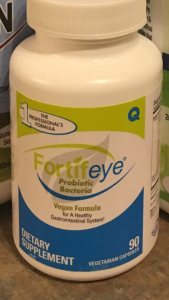 I developed a probiotic called Fortifeye Probiotics that is shelf stable at room temperature. I also recommend for Breakfast and lunch following a paleo meal plan. Always discuss your weight loss goals with your physician . I do also recommend checking with your physician prior to starting an exercise program . Drink to your health!! ← Dr Michael Lange discusses the importance of maintaining Glutathione levels for good eye and overall health.